Diversions: "A Trip to the Moon on Gossamer Wings"
"A Trip to the Moon on Gossamer Wings"
Here is another Illustration Friday submission (click to enlarge). The theme was "insects".I wanted to try to play with photo-collage this time. I think it lacks a little of the depth that I wanted it to have, but over all, I like the way it turned out. I think there are lots of '"techniques" here that are all different, but still mesh well together. The name "A Trip to the Moon on Gossamer Wings" comes from an old Cole Porter song. I think it fits this little illustration beautifully. If any of you are interested in this as a desktop wallpaper, I might be able to do that. Just let me know in the comments! 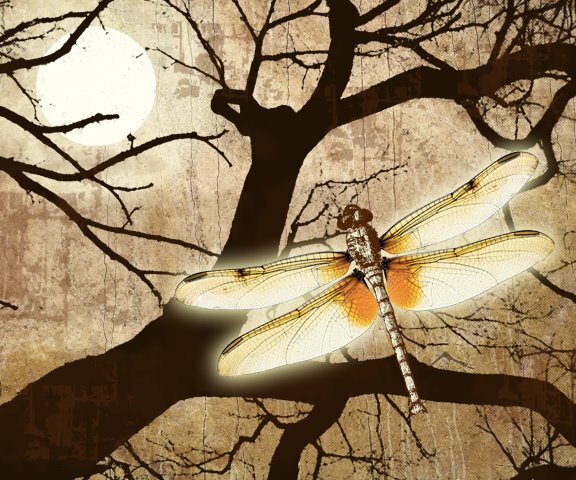 Beautiful light - in the moon and dragonfly. Nice! beautiful illustration, what are else are you going to use this for? princess- nothing really. just for illo. friday fun! Stretching my brain, sort of thing. Very nice. I like the contrast between the oriental looking background and the more perfect sort of computer illustration of the insect. Ooh, very nice indeed. I like it on all its levels.. the background, the glow, the colors, everything. Mary, I've been doing Illo Fri for a while, and thought I was the only Alabamian. This past week, I discovered several.I've always viewed every entry,but it's grown soo much,that's becoming impossible! nice! i'm really diggin' this one.